Poaching may be the single greatest threat to hunting. In my 30-plus years in the hunting industry, one of the most common misconceptions among non-hunters is that poachers are hunters. This gives anti-hunting extremists unjustified ground to stand on as they try and put hunters in a bad light. In truth, as America's No. 1 conservationists, hunters are the first to protect and crack down on the exploitation of wildlife. In 1995 in my home state of Colorado, a poacher—not a hunter—killed a famous and highly photographed trophy bull elk nicknamed Samson with a crossbow at the Estes Park Center of the YMCA of the Rockies. The outrage from hunters and other residents had profound impact on state wildlife laws. In 1998 Samson's Law was passed, raising fines for the poaching and/or possession of any animal considered trophy-class to as much as $25,000. In 1981, Arizona hunters helped to establish Operation Game Thief (OGT) in 1981—today the nation’s premier wildlife crime-stopper program—to assist game wardens in the battle against poaching by paying rewards to those who anonymously report criminals. By statute, the OGT depended on private funding, so hunters mobilized to pay the bill. Funds rolled in from the Houston Safari Club, Dallas Safari Club and Arkansas Rod and Reel Club. Today the state's OGT fields 1,500-plus calls per year. In a report released in February 2016, Louisiana's OGT program alone awarded $16,800 in rewards in 2015. It reviewed 43 cases involving deer (27), migratory game birds (3), turkeys (7), commercial fish (3) and an alligator; apprehended 72 criminals and wrote 385 citations. LOGT has paid $375,700 since its inception in 1984. So when asked, "Why do hunters poach?" explain poachers aren't hunters. A hunter doesn't shoot a mature buck, behead it and steal its rack for bragging rights or to sell. A hunter doesn't shoot a rhino, steal its horn and leave the rest to rot. NRA Hunter Services maintains a list of poaching hotlines for all 50 states. Click here for more information. 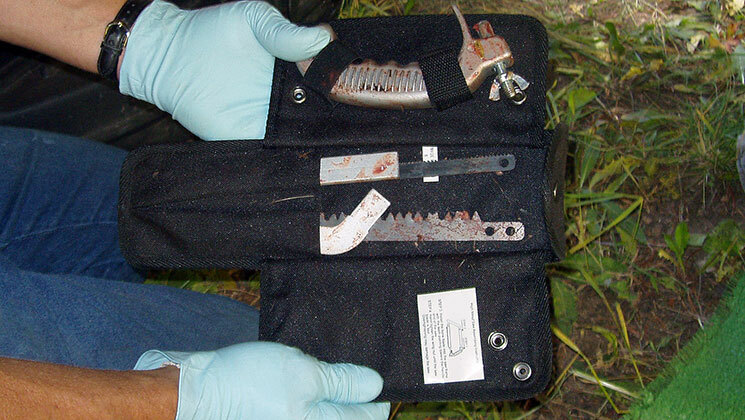 A poacher's butcher kit confiscated by law enforcement. FIVE FAST FACTS: Need more on the difference between poaching and hunting? Poaching is illegal and unethical. Hunting is legal and ethical. Poachers are no different from thieves who break into a store to rob a cash register. They trespass, kill and steal animals and fish illegally, often for profit. Poachers kill game and non-game animals and threatened and endangered species. Anti-hunting extremists call poachers hunters to give law-abiding hunters a bad rap. Poaching is a costly crime. It robs legitimate sportsmen of game and fish, robs land owners, businesses and taxpayers of revenue generated by hunting and fishing, and robs humans of our valuable, renewable, wildlife natural resources. Poaching is uncontrolled and unmonitored. Hunting is a controlled game management tool that keeps populations in check with available habitat, or carrying capacity.